Apache Eclypse +/ suddenly passed away at their farm in Kelowna, BC. 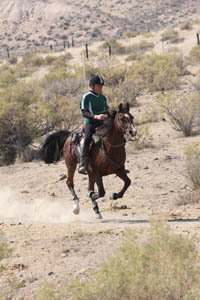 The 17-year-old gelding had amassed over 3500 endurance miles in his 12-year career, with 6 100-mile completions and 13 Best Condition awards, in competitions all over Canada and the US, in both national and international rides. Apache Eclypse, by Bey Eclypse out of Apache Gem by Silver Apache, was a part of the family, and a horse with great character. Elroy once said of him: "If he could, he'd stop and look at himself in every mirror he passed!"